This book puts the fundamental and advanced concepts behind electric drives into practice. Avoiding involved mathematics whenever practical, this book shows the reader how to implement a range of modern day electrical drive concepts, without requiring in depth programming skills. It allows the user to build and run a series of AC drive concepts, ranging from very basic drives to sophisticated sensorless drives. Hence the book is the only modern resource available that bridges the gap between simulation and the actual experimental environment. 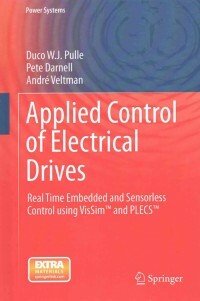 Engineers who need to implement an electrical drive, or transition from sensored to sensorless drives, as well as students who need to understand the practical aspects of working with electrical drives, will greatly benefit from this unique reference.